Simplicity with impact The garden grew gradually, between 1925 and 1939. The house is surrounded by a formal Italian garden, which is divided into geometrical ‘rooms’ by box hedges with lemon trees in terracotta pots. The Garden is now 2010 growing again for future generations to enjoy. To grow a beautiful garden takes time. To grow a secret garden with Simplicity and impact takes even longer. It is paradoxical that the present on one hand is characterised by a great interest in the process itself, in nature as it unfolds and blooms, withers and regenerates, yet on the other by an impatience that makes us prefer plants to be ‘grown-up’ from day one. It seems like this notion of the process is not fully realised, seeing that the finished version is preferred to the slowness of evolution. The team has linked La Foce’s name, garden and architecture to create a distinct identity which can, in time, act as a unique signature for the place – and the entire region. Worldwide is has become evident that modern art is no longer elitist. Museums such as the Guggenheim and Tate Modern has proven that art in the right setting can make masterpieces accesible to all – and help create regional brands. 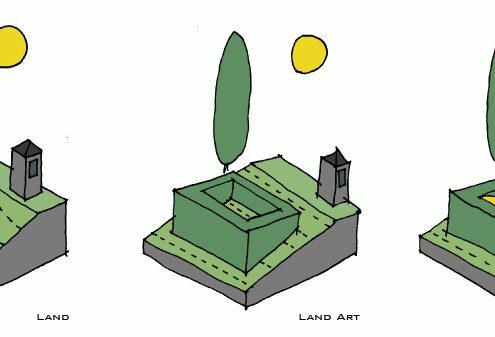 The Secret garden hopefully places La Foce on the world map of the contemporary land art and solar energy scene. 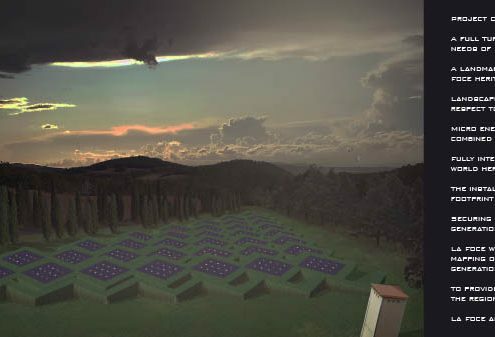 Our secondary recommendation would be to use some 10 Scotia Sun Masts to light the immediate area around the villa and to provide a subtle “renewable energy face” for La Foce that meets the aesthetics of the location. This may require a custom designed lamp head that meets the needs of the location from both the classical and contemporary view points. 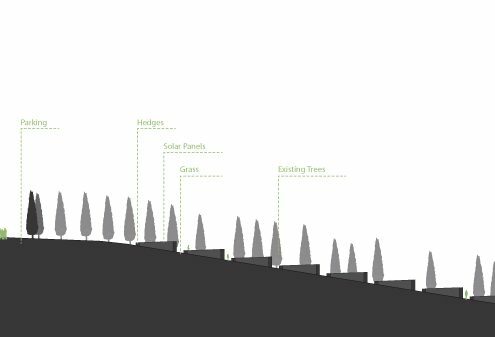 The Scotia Sun Masts would be placed in optimal positions like the entrance roads, the crossing to Castelluccio plus your car park and the future open air restaurant. 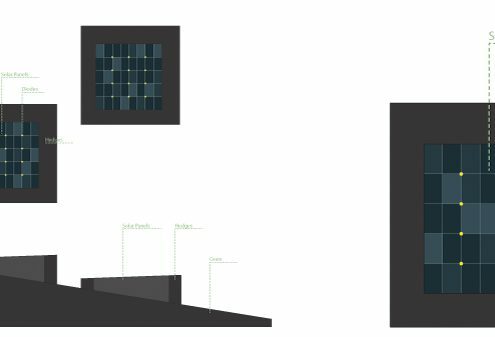 Further to the visual and social considerations our solar lighting systems meet all the regulations for street lighting thus producing zero emission street lighting solution for the local commune. Our primary concept would be to create a minimal and unique “secret garden”. A landscaped solar installation that follows the fall of the land to the north and yet can still produce near optimum yields due to its form. 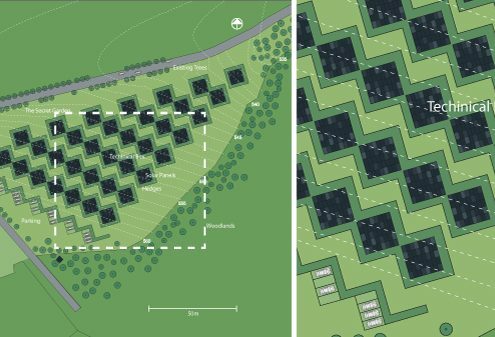 This will be a work of beauty and would be best described as a solar labyrinth and could further be described as an extension to the 21C Cecil Pinsent landscape gardens of the main villa. It therefore would be an addition to your garden tours of the future and provide all the energy needs of the villa and more. 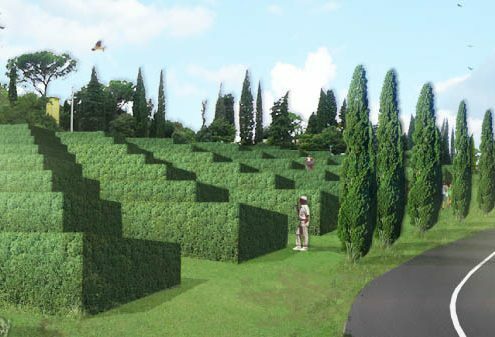 La Foce will be a Green Estate in the middle of a world heritage site. The additional aim of this garden is that it provides an event during the evenings. After dark the Secret garden would come to life providing a mirror of the night sky and its stellar constellation. A seamlessly programmed sequence of light and movement , plus the subtle colour change within in each “star/RGB diode” will provide a depth and movement of light that could be compared to the hypnotic reality of our universe.